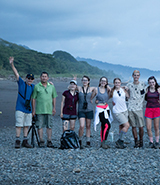 The mission of the Rollins Foundations in the Liberal Arts program is to empower students to make connections across multiple perspectives and to anticipate an increasingly global future. At Rollins we understand that 21st century problems won’t be solved in isolation. We have designed our general education program to be both developmental (growing along with the student) and integrative (fostering connections between coursework and to the world outside the college). In your Foundations Seminar, you will learn how different disciplines turn a particular lens toward a question and then bring those perspectives together in a capstone class that tackles a complex global problem. 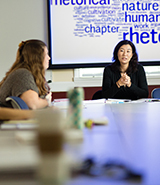 The qualities of responsible leadership are forged in intellectual community, in courses where professors lead students to encounter new ways of thinking, to place things in context, and to construct a critical conversation through research and original analysis. As you rise through the program, you will also acquire foundational competencies in writing, foreign language, health and wellness, ethical reasoning, and mathematical thinking—skills that will prepare them to lead in a changing world. It’s no coincidence that the skills you will develop in your Foundations Seminar are exactly what employers say they want from new hires —the skills to communicate, solve problems, and collaborate. The Foundations curriculum models the pursuit of a meaningful life by taking learning outside the walls of the classroom. Your participation in these courses includes experiential learning that often includes attendance at campus events; these events allow you to take advantage of some of the most important opportunities that a liberal arts college affords. 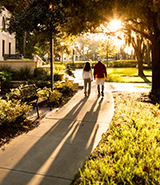 Rollins opens its doors to the public by bringing nationally and internationally recognized speakers to campus, staging plays at the Annie Russell Theater, concerts in Tiedtke Hall, and exhibitions at the Cornell Fine Art Museum. In this way, intellectual community becomes a lifelong pursuit, a pursuit that begins with your Foundations coursework.